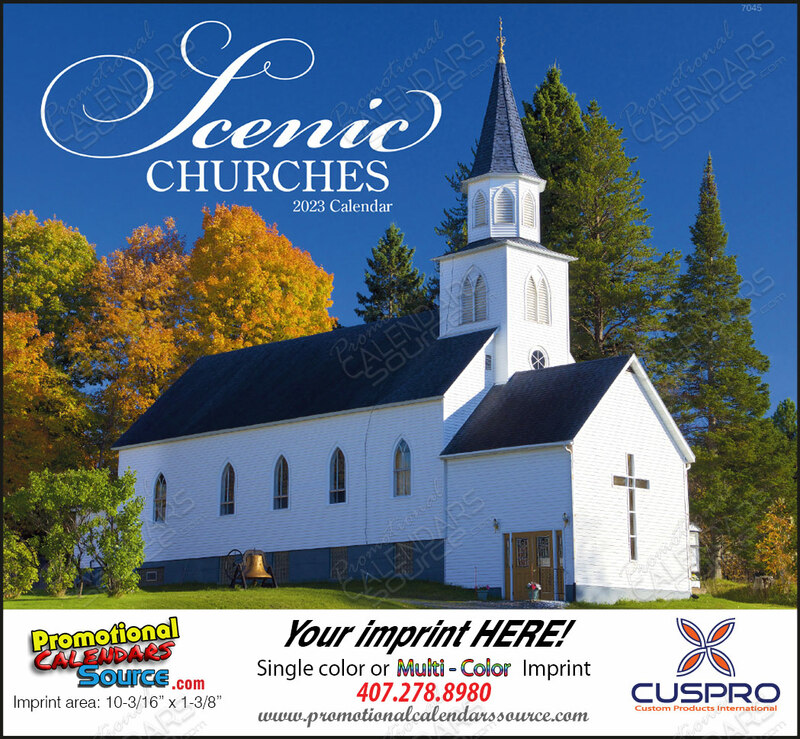 Scenic Churches a wall calendar with stitched binding. 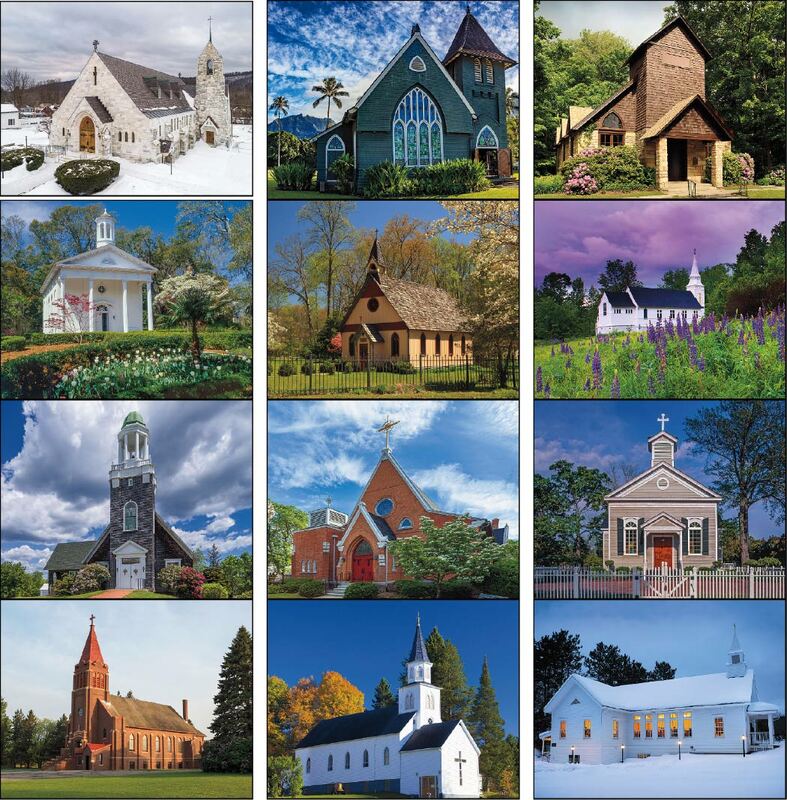 Features images of charming country churches. Perfect religious setting ideal for different congragations. 11x19 inches Open size with generous ad copy area on the back flap. ✪ Any One Color imprint included in price. Pick from the stock colors or specify your PMS color. ✪ All colors created out of 4-Color Process. ✪ Full-Color Ad printed for just $ 0.10 additional per unit. Personalization and Mailing Service available, contatc us for details. If you are ready to purchase, enter desired quantity in the Quantity box below the price grid (Quantities in Price grid are quantity price brakes). You can enter any quantity that you want in increments of 10 units, with a minimum quantity as shown unless otherwise noted. Once you have entered the desired quantity, click on the ADD TO CART button to proceed to Step 2. You will be now taken to Step 2 where you will enter information specific to your order. Fill text fields with information necessary to complete your order. Provide any additional instructions in the communication fields provided. You can upload your artwork via the Art Upload field in Step 2 if less than 3MB in size. You can send us your art via email to art@cuspro.net. For large files use our ART UPLOAD page. NOTE: Art must be of High Resolution quality at 300 DPI or more and size to be printed or larger. Vector format is preferred. Art charges may apply if art is of low quality and needs to be retouched or redrawn. Once you have entered all the information verify that all is correct and then click on the NEXT button. Follow the easy additional steps through the Shopping Cart to finalize your purchase. At Checkout you will be asked to log in if you are a returning customer, or set up a login profile. This will only take a minute or two, depending on how fast you type. Click on the Submit button. After you login you will complete the checkout process with required information. Congratulations, you have placed your order. An Order Confirmation email will be sent to you. We will review your order and contact you if there is any issue. You will then receive a Sales Order with all details including shipping charges and any additional charges that apply, for your final approval. Review the Sales Order, Sign it and return it to us so we can proceed with order. Payment will be processed once we receive your signed approval. 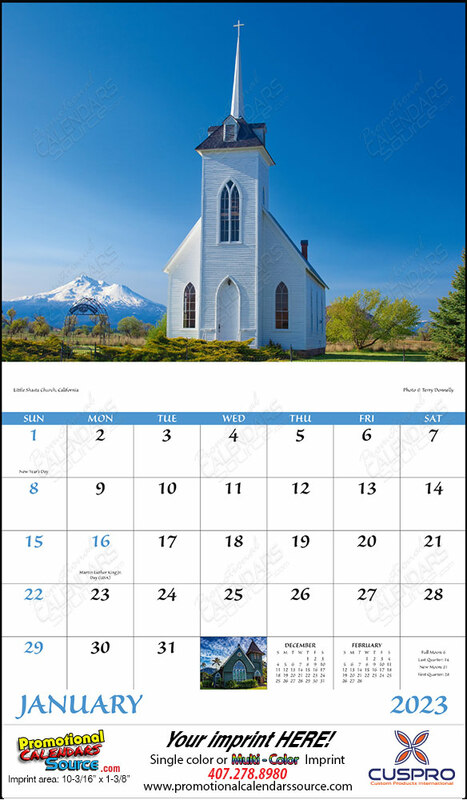 PRODUCTION TIME: Most calendars are produced in 12 working days after we receive signed Sales Order & Payment. If you need order in hands for a specific date contact us before placing order to verify availability.